Last Monday saw Billy Joel's first solo concert in Glasgow for about 12 years. I had seen him when he last performed in Glasgow when the Face To Face tour he did with Elton John came to Ibrox Stadium in 1998. That was great, but this one was even better! I had a great seat in the middle of the auditorium and as I waited for the concert to start saw one of the best things I've seen at a concert in a long time. A few members of BJ's staff appeared in the arena with small strings of tickets. They then went to some of the not-so-good seats in the arena and asked the people if they would like to move seats. When the people said yes, they were handed the new tickets and pointed in the direction of the nearest security person. The security person then escorted the people to their new seats - one of the front 3 rows right in front of the stage! The looks on their faces were ones of amazement and bewilderment, but it was great to see and great to think that someone would do something like that as a little surprise for people who take the time to go to one of their concerts. Personal highlights from the concert itself included the opening, "Miami 2017" immediately being followed by "New York State of Mind", the band covering AC/DC's "Highway To Hell" and the last half dozen or so tracks (including the whole Encore). Here's the setlist. It's been a long time since he toured and, sadly, it'll probably be another long time until he tours again. One thing's for certain, though, I'll be there! P.S. Which concert did I prefer - Guns 'N Roses or Billy Joel? As good as GNR were, Billy Joel wins it! Last night was a night for nostalgia. A night for letting whatever hair I've got left down and enjoying a great night out listening to songs that got me into rock music in the first place. Guns N' Roses came to Glasgow last night for what I understand was their first ever gig on Scottish soil. My best mate, Peter, and I went along to see if Axl and the new band that he had created under the GNR banner would be able to even remotely match the band that we grew up listening to - and that Peter had seen live in Gateshead however many years ago. They blew the place apart! The 2 support acts - Towers Of London and Bullet For My Valentine were, ahem, competent. Towers did a great metal cover of Lynyrd Skynyrd's classic "Freebird" (the only track we were in the arena to hear them play) while BFMV basically sounded like it was just one long session of screaming into microphones. I had read the reports on the internet about Axl apparently not going on stage before 10pm on this tour. BFMV left the stage at 8:30pm and the stage crew set to work getting the stage ready for GNR. They were done by 9 and the crowd stood there waiting. And waiting. And waiting. After about half-an-hour of waiting, the booing and jeering started between the songs that were being played over the PA system. Another 15 minutes and the paper cups that people's drinks were in were starting to get thrown. At 10:04pm, the house lights went off and the place went mental and cheered the opening notes to "Welcome To The Jungle" as each member of the band walked on stage. With everyone on stage and Axl at his microphone, he shouted "you know where the f*** you are?" and we were off on a trip down rock memory lane as the first 2 tracks on "Appetite For Destruction" - GNR's first album - "Welcome To The Jungle" and "It's So Easy" were played - brilliantly. Peter and I felt like we were 15 again! Right, I'm off to try to recover! I hurt in places I forgot that I would hurt in after a rock concert like that!!! Well, after THE worst couple of weeks of my life so far, I’ve now got a couple of weeks that I have been looking forward to for what seems like ages! It all starts this Friday night when my best mate, Peter, and I go to the SECC in Glasgow to see a nice quiet beat-combo from America – Guns N’ Roses! That’s right, Axl and his band will be in town to blow us all away with some classics, as well as (maybe) a few from the forever-upcoming album “The Chinese Democracy”. Should be a blast! I’m sure Peter saw them live during the early ‘90s, so it will be interesting to see how they compare to the original line-up. I have another concert at the same venue the following Monday night. A little bit of a contrast compared to the GNR gig – Billy Joel. Told you it was a little contrast! I saw him live in 1998 at Ibrox where he and Elton John appeared in their “Face To Face” tour. He wasn’t well that day but still managed to give a great performance of a whole bunch of classic hits. Now, it’s just him on his own doing what looks like being a great gig! To be honest, I don't know which concert I am more excited about as I can't wait for either of them! I’ve also been invited to a couple of birthday parties – one at Peter and Janice’s to celebrate the first birthday of their son, Andrew (a year? already??) and one for a workmate’s 30th which is being set up as a fancy dress party. And at last, we come to the one thing that I’ve been looking forward to more than anything over the last wee while – the 2006 FISM World Championships of Magic. FISM – a French acronym for the International Federation of Magical Societies – is a convention that is held every 3 years in a different city around the world. The main part of it is a huge competition in which different performers compete to decide the World Champion magicians in both Close Up and Stage Magic for the next 3 years. I could go on about this for hours, but instead I’ll point you in the direction of both the FISM Organisation website as well as the website for this year’s FISM Convention itself. I fully intend watching the whole Close Up Competition and will post up what I thought of the different acts once I get a chance to do so, as well as general thoughts of the Convention itself. 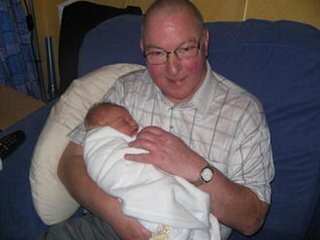 Last Wednesday - 5 July 2006 - at 4:30pm my Dad, Alexander Campbell McLanachan, known to the world as Campbell, died after spending several days in Crosshouse Hospital, Kilmarnock. He was 65 years, 4 months and 19 days old. Dad became unwell on Sunday when he was at the local Co-op store to pick up the papers. He suffered a Cardiac Arrest in the back of the ambulance, but the Ambulance crew managed to get him re-started. Upon arriving at Crosshouse, Dad suffered a second Cardiac Arrest. This one, however, lasted 30 minutes. After we had been told about that, we basically knew that things were very grim. As it was, the Intensive Care staff tried to ventilate him, cooling his body down so that it was only using the minimum amount of energy to run his major organs in an attempt to see if they could stop any brain damage from setting in. As it was, when all the drugs were withdrawn and he didn't waken up, we knew that it was only a matter of time. That was the Tuesday morning. As it was, he survived until the Wednesday afternoon. I always knew he was a fighter! When he did finally pass away, it was just Mum and Dad together in the room. When Mhairi, my Sister, and I thought about it for a moment we realised that that was how we, as their children, would have wanted it. Yesterday - 11 July 2006 - saw Dad's funeral. It was a happy affair - if happy can be used to describe a funeral. On Dad's request, there were very few black ties - I wore my kilt!!! Never thought I'd be doing that! The minister kept the service fairly light. And when Dad's 2 tunes started up - "The Great Pretender" by The Platters and "Great Balls of Fire" by Jerry Lee Lewis - there were chuckles throughout the Crematorium. On behalf of the family, I'd like to thank everyone who turned up and packed the Crematorium out yesterday. We were all really touched. Also, our thanks to the staff at the Stewarton Co-Op for looking after Dad when he became unwell and to the staff at A&E, Intensive Care and Ward 3B at Crosshouse Hospital for their care of both Dad and the rest of us. They did not "sugar coat" anything and told us what we needed to know without trying to get our hopes up too much. Dad with his youngest Grandson, Cameron. Folks, can you all do me a wee favour? The next time you're talking with your loved ones, remember to tell them that you care about them and make sure you do before it is too late.